Moving to a new city is an emotional experience. Even though it can be a stressful, there is a lot to look forward to as you make your way to a new home. Ft. Lauderdale is a wonderful place to get settled into and start boating. Nicknamed “the Venice of America”, its easy to see why this gorgeous location is the megayacht capital of the world. 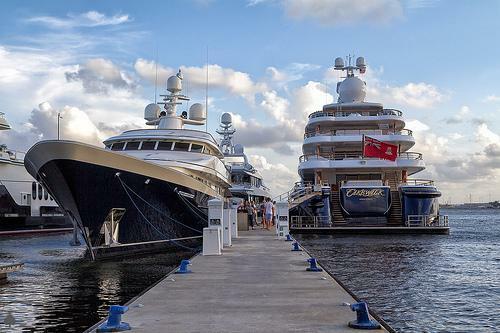 Ft. Lauderdale is home to some of the best marinas in the world. Marina Mile Yachting Center tops this list with its full-service shipyard. They have dock spaces up to 150 ft, an undercover graving dock, and they even offer boat repairs and detailing. The shipyard is open seven days a week and they make flexibility the key. Some of the other marinas in the area include the luxurious Hilton Ft. Lauderdale and the famous Pelican Landing. 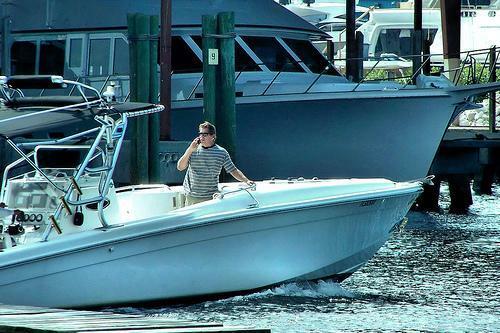 Boating is a great leisurely pastime. For the experienced sailor, Ft. Lauderdale is an easy spot to get acquainted with but if you’re new to boating and the area, it’s important to understand how to stay safe. Though Florida is known for its sunny weather, residents should be aware of an annual storm season. During this time, the weather becomes complicated and even dangerous. A main concern for any water sport, the weather plays a big factor in how well a sailor will be able to manage these activities. Before setting out, make sure you have checked an exact weather forecast for the day. Don’t take risks if your area has been issued with a weather warning. Unfortunately, even the most dialed in forecast may not always be the most accurate advisory for the day. The weather may change unexpectedly, and in this case, you should always be ready with a sturdy anchor and line that is the appropriate length and size. The most important thing is to make sure all passengers are wearing life jackets. If you see dark clouds approaching, a squall or thunderstorm may be on its way. If the winds begin blowing in the opposite direction of the currents, a dangerous wave pattern may form which can easily capsize a boat. If you see dark clouds approaching quickly, the best thing to do is get to land or find an area away from the strong waves and wind. If you are caught in a storm, make sure your radio is tuned to stations giving weather broadcasts and plan accordingly. Even with perfect weather, you should take precautions to make sure you will stay safe in the event of the unexpected. While sailing longer distances, the danger factor only increases. Make sure to keep oars or paddles onboard in case of engine failure. You never know how well your engine will hold up in a storm or accident. Store flares and other visuals to use as distress signals in the event of an emergency. This way you won’t end up stranded in the water. When you first see Ft. Lauderdale, it is clear that it is a boat-lover’s paradise. With miles and miles of stunning yachts and boats, you begin to realize it’s the scenery that keeps people coming back. Some of the finest boating destinations in the world can be found in the Ft. Lauderdale area. For a change of pace, every October you can check out the annual boat show, a tradition for the last 55 years. The Ft. Lauderdale International Boat Show boasts a wonderful time spread out over 300 miles of waterways. Spread out into five different locations, there are more than 40,000 boats participating each year. Be a tourist and make use of the transportation network made up of buses, water taxis, and riverboats to make sure you don’t miss out on any of the fun. If you want to make the sea your playground, check out a variety of watersports. You can rent equipment throughout the day to enjoy activities like parasailing on a catamaran or learning to surf on the gentle waves. Take your boat out and see how well your friends do at water skiing or relax until sunset with some fishing. Diving is a popular activity to do locally. There are several beautiful locations where an experienced diver can do it from their boat. Divers from all over to see the reef system at the popular Deerfield and Hallandale Beaches. This beautiful natural reef boasts three tiers starting as shallow as 20 feet of water. Since it is one of the hottest tourist attractions, there are many scuba diving instructors and rental equipment available from any of the local dive centers. The Las Olas Boulevard might be part of the spread you now call home. “Las olas” means “the waves” in Spanish and with several canals interlaced, it is clear to see where the thoroughfare gets its name. The district is home to beautiful scenery, homes, and culture. You can find its historic house, a museum and an art house movie theater nearby. Popular for its dining and shopping, you will find it’s a fun destination to sail to. If sightseeing is the goal, you can set out in the morning to visit the famous Florida Keys. By boat, the trip will take about three hours, but the route is a beautiful escape that can gear you up towards the vacation you can enjoy there. Make reservations at one of the marinas in Key West. Experienced boaters can cruise along the Atlantic side of the Keys. You will navigate through the specially marked Intracoastal Waterway and find your way to the marinas. You’ll never forget this adventure! As you settle in to your new home, you’ll rest easy knowing that you never have to settle for less. Fort Lauderdale is more than just your new home, it’s a stunning way of life. Be safe, be prepared and have fun in your new boating life in this gorgeous community.